By 1940, it was considered to be underpowered, to have inadequate defensive armament, and to carry too small a bomb load. Many were destroyed during the attacks on Pearl Harbor and the Philippines in December 1941. In 1942, the surviving B-18s were relegated to antisubmarine, transport duty, and training. A B-18 was one of the first American aircraft to sink a German U-boat, U-654 on 22 August 1942 in the Caribbean. In 1934, the United States Army Air Corps put out a request for a bomber with double the bomb load and range of the Martin B-10, which was just entering service as the Army's standard bomber. In the evaluation at Wright Field the following year, Douglas showed its DB-1. It competed with the Boeing Model 299 (later developed into the Boeing B-17 Flying Fortress) and Martin Model 146. While the Boeing design was clearly superior, the crash of the B-17 prototype (caused by taking off with the controls still locked) removed it from consideration. During the depths of the Great Depression, the lower price of the DB-1 ($58,500 vs. $99,620 for the Model 299) also counted in its favor. The Douglas design was ordered into immediate production in January 1936 as the B-18. The DB-1 design was essentially that of the DC-2, with several modifications. The wingspan was 4.5 ft (1.4 m) greater. The fuselage was deeper, to better accommodate bombs and the six-member crew; the wings were fixed in the middle of the cross-section rather than to the bottom due to the deeper fuselage. Added armament included nose, dorsal, and ventral gun turrets. Preston Tucker's firm received a contract to supply a remote controlled gun turret for the aircraft. Douglas B-18 formation during exercises over Hawaii, 1940–1941. Deliveries of B-18s to Army units began in the first half of 1937, with the first examples being test and evaluation aircraft being turned over to the Materiel Division at Wright Field, Ohio, the Technical Training Command at Chanute Field, Illinois, the Aberdeen Proving Ground, Maryland, and Lowry Field, Colorado. Deliveries to operational groups began in late 1937, the first being the 7th Bombardment Group at Hamilton Field, California. Production B-18s, with full military equipment fitted, had a maximum speed of 217 mph, cruising speed of 167 mph, and combat range of 850 miles. By 1940, most USAAC bomber squadrons were equipped with B-18s or B-18As. However, the deficiencies in the B-18/B-18A bomber were becoming readily apparent to almost everyone. In range, in speed, in bomb load, and particularly in defensive armor and armament, the design came up short, and the Air Corps conceded that the aircraft was obsolete and totally unsuited in the long-range bombing role for which it had originally been acquired. To send crews out in such a plane against a well-armed, determined foe would have been nothing short of suicidal. However, in spite of the known shortcomings of the B-18/B-18A, the Douglas aircraft was the most numerous American bomber type deployed outside the continental United States at the time of the attack on Pearl Harbor. It was hoped that the B-18 could play a stopgap role until more suitable aircraft such as the Boeing B-17 Flying Fortress and Consolidated B-24 Liberator became available in quantity. The B-18s remaining in the continental US and in the Caribbean were then deployed in a defensive role in anticipation of attacks on the US mainland. These attacks never materialized. B-17s supplanted B-18s in first-line service in 1942. Following this, 122 B-18As were modified for anti-submarine warfare. The bombardier was replaced by a search radar with a large radome. Magnetic anomaly detection (MAD) equipment was sometimes housed in a tail boom. These aircraft, designated B-18B, were used in the Caribbean on anti-submarine patrol. On 2 October 1942, a B-18A, piloted by Captain Howard Burhanna Jr. of the 99th Bomb Squadron, depth charged and sank the German submarine U-512 north of Cayenne, French Guiana. Two aircraft were transferred to Força Aérea Brasileira in 1942 and used with a provisional conversion training unit set up under the provisions of Lend-Lease. They were later used for anti-submarine patrols. They were struck off charge at the end of the war. In 1940 the Royal Canadian Air Force acquired 20 B-18As (as the Douglas Digby Mark I), and also used them for patrol duties, being immediately issued to 10 Squadron to replace the squadron's Westland Wapitis. Bolos and Digbys sank an additional two submarines during the course of the war. RCAF Eastern Air Command (EAC) Digbys carried out 11 attacks on U-boats. U-520 was confirmed sunk by Flying Officer F. Raymes' crew of No. 10 (BR) Squadron, on 30 October 1942. east of Newfoundland. However, the antisubmarine role was relatively short-lived, and the Bolos were superseded in this role in 1943 by Consolidated B-24 Liberators which had a much heavier payload and a substantially longer range which finally closed the mid-Atlantic gap. Some of the Douglas Digbys in Canadian service were converted to either C-58s or used for training. Manufacturer's designation for prototype, first of B-18 production run, 1 built. Trainer B-18 with bomb gear removed. Manufacturer's designation for prototype with powered nose turret; last of B-18 production run, 1 built. B-18 with more powerful Wright R-1820-53 engines and relocated bombardier's station, 217 built. Trainer B-18A with bomb gear removed. Antisubmarine conversion, 2 converted. Fixed forward-firing .50 cal machine gun, starboard side of the fuselage near lower nose glazing. Improved version of B-18 using Wright R-2600-3 radial engines (1,600 hp/1,194 kW). Never built, largely due to better light bombers such as the B-23 Dragon. B-18A Bolo 37-0469 from the 38th Reconnaissance Squadron on display at the National Museum of the U.S. Air Force. 36-446 – Kohala Mountains, Hawaii. Tail code "81 50R". Crash-landed due to engine failure on February 25, 1941. Crew was rescued and the aircraft was abandoned; it remains in a gulch on private land. The Air Force later recovered the nose turret for 37-029 and the dorsal turret for 37-469. There have been plans to recover the aircraft for the Pacific Air Museum in Honolulu. 37-029 – Castle Air Museum at the former Castle Air Force Base in Atwater, California. Dropped from USAAF inventory in 1944, it was registered as NC52056 in 1945, later to N52056. 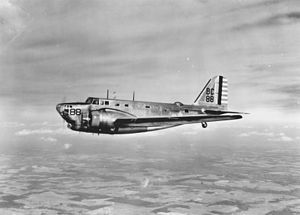 The B-18 was used by Avery Aviation and then Hawkins and Powers, as a firebomber, dropping borate for many years. 37-469 – National Museum of the United States Air Force at Wright-Patterson Air Force Base in Dayton, Ohio. One of the first production Bolos, was delivered to Wright Field in 1937 for evaluation testing. Sold as N56847, converted to crop sprayer; by May 1969 stored derelict at Tucson, Arizona. It sat outdoors for many years before being restored to static display condition. This aircraft has an incorrect dorsal turret. The museum has been attempting to locate a correct turret for this aircraft for many years. 39-025 – Wings Over the Rockies Air and Space Museum at the former Lowry Air Force Base in Denver, Colorado. This Bolo spent World War II at several airfields as a bombardier trainer and as a light transport. It was dropped from inventory on 3 November 1944, and was later sold, acquiring the civil registry NC62477. It spent 14 years on the civil registry before going to Cuba in 1958. In November 1958 the aircraft was seized in Florida by US Treasury agents when it was hauling guns to Fidel Castro. In 1960, the aircraft was parked at Cannon AFB, New Mexico, until being presented to the National Museum of the United States Air Force at Wright-Patterson AFB. It flew to the museum in April 1961. In 1988, the aircraft was transferred to the Wings Over The Rockies Aviation and Space Museum where it was restored though the 1990s. It is displayed there as AAC Ser. No. 39-522. 37-505 – At the McChord Air Museum, McChord AFB, Washington. Sold as N67947, then Mexican registration XB-JAJ. Acquired by Tucson Air Museum Foundation of Tucson, Arizona and stored at Watsonville, California. This was the last flyable B-18, making its final flight to Tucson on 10 April 1971. At Pima Air & Space Museum in 1973, it was subsequently acquired by the National Museum of the United States Air Force in 1981 and moved to Davis-Monthan AFB, Arizona for storage, then in 1983 put on display at the McChord Air Museum. Access to the McChord Air Museum is currently restricted to military personnel (active, reserve, national guard, retired), and their dependents unless a base visitor pass is acquired in advance. 38-593 – Pima Air & Space Museum adjacent to Davis-Monthan Air Force Base in Tucson, Arizona. This Bolo spent the early part of WWII on anti-submarine patrol. In 1943 began use a light transport. She was retired and struck from the inventory in 1945. Was operated as a firebomber as N66267, 1954–1970. In storage at Phoenix Goodyear Airport, Litchfield Park, Arizona by September 1969, then delivered to Pima on 5 September 1976. The aircraft sat outside in the desert for many years before being restored and moved indoors for display. The aircraft is still equipped with an antisubmarine search radar dome. ^ "Historical Listings: Brazil (BRZ) Archived 2012-10-18 at the Wayback Machine." World Air Forces. Retrieved 19 May 2011. ^ Conaway, William. "Confirmed Sinkings of German U-Boats by VI Bomber Command Bombardment Aircraft." Planes and Pilots of World War 2, 2000. Retrieved 4 August 2011. ^ Steve Lehto, Jay Leno (2016). Preston Tucker and His Battle to Build the Car of Tomorrow. Chicago Review Press. ISBN 9781613749562. Retrieved 2017-02-01. The chief of the air corps called the turret “ingenious” and invited Tucker to a conference at Wright Field to discuss the needs of gun turrets with the military. ^ Uboat.net: "B-18 sinks U-512." uboat.net. Retrieved: 17 May 2010. ^ "Douglas Digby." rcaf.com. Retrieved: 17 May 2010. ^ "Canadian Digby sinks U-520." Uboat.net. Retrieved: 17 May 2010. ^ Pigott, Peter (2005). On Canadian Wings: A Century of Flight. Ontario: Dundurn. p. 83. ISBN 9781550025491. Retrieved 28 August 2018. ^ "B-18." Archived March 15, 2007, at the Wayback Machine National Museum of the USAF. Retrieved: 17 May 2010. ^ "B-18A." Archived January 13, 2009, at the Wayback Machine National Museum of the USAF. Retrieved: 17 May 2010. ^ "B-18B." Archived January 13, 2009, at the Wayback Machine National Museum of the USAF. Retrieved: 17 May 2010. ^ "XB-22." Archived January 13, 2009, at the Wayback Machine National Museum of the USAF. Retrieved: 17 May 2010. ^ "List of survivor B-18s on display or restoration." Warbird Resource Group. Retrieved: 9 April 2012. ^ "Hawaii: Big Island B-18". Wreckchasing Message Board. Retrieved July 8, 2017. 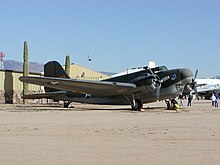 ^ "B-18 Bolo". Warbird Information Exchange. Retrieved July 8, 2017. 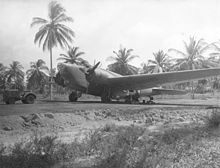 ^ "B-18 Bolo, s/n 37-029." Castle Air Museum. Retrieved: 15 December 2017. ^ "B-18 Bolo, s/n 37-469." National Museum of the United States Air Force. Retrieved: 18 November 2015. ^ "B-18 Bolo, s/n 39-025." Wings Over the Rockies Air & Space Museum. Retrieved: 15 December 2017. ^ "B-18 Bolo, s/n 37-505." McChord Air Museum. Retrieved: 9 April 2012. ^ "B-18 Bolo, s/n 38-593." Pima Air & Space Museum. Retrieved: 9 April 2012. ^ Francillon 1979, pp. 208–209. Francillon, René J. McDonnell Douglas Aircraft Since 1920. London: Putnam, 1979. ISBN 0-87021-428-4. ——— (1988), McDonnell Douglas Aircraft Since 1920, I, Annapolis, MD: Naval Institute Press, ISBN 0-87021-428-4 . Gradidge, Jennifer M. The Douglas DC-1, DC-2, DC-3 – The First Seventy Years (two volumes), Tonbridge, Kent, UK: Air-Britain (Historians), 2006. ISBN 0-85130-332-3. Kostenuk, Samuel and John Griffin. RCAF Squadron Histories and Aircraft: 1924–1968. Toronto: Samuel Stevens, Hakkert & Co, 1977. ISBN 0-88866-577-6. 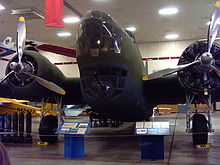 Wikimedia Commons has media related to Douglas B-18 Bolo. B-18 Bolo (factsheet with gallery), USAF Museum, archived from the original on 2007-03-15 . Baugher, Joseph ‘Joe’ (ed. ), "Douglas B-18 Bolo", USAF bombers, Baughers . "Douglas B-18 Bolo / B-23 Dragon", Douglas DC-1 / DC-2 Military Series .